Here is a review I think my homeschooling friends will be interested in. Although this is not part of our Back to School Event, this may be just the product you are looking for. We received Draw to Learn Proverbs ($14.95 each) from the Notgrass Company. I also received their other Draw to Learn books in eBook form ($9.95 each). I highly recommend the downloadable option, because you can just print off as many copies as you need. Also you can use them again and again. The Draw to Learn series can be used with all ages. Should you choose to purchase the physical book though and desire to have more than one student use the book, you might want to consider doing what I did. No, I did not copy the pages. We purchased drawing pads and as they went along each one read what was needed and then did the drawing in their own art pad. Simple, easy and saves the book for future use. The Draw to Learn books are perfect for Bible class. Not only do you read over the verse, but your drawing assignment is based on the verse. Now, for those of you who are like me and only use the KJV, all of the verses are not KJV. To be quite honest this was not a problem, because we just read out of our own Bibles, and since we were using our own art pads we just used the instructions at the bottom of each page. You are to read, think, draw. First you read the passage and then spend some time thinking about it, before you finish by drawing your picture. Some of you might remember that I mentioned this program awhile back when my daughters and I spent a Sunday at home together. We began the program then and each did the first lesson together. The first lesson is the only one I saw in Proverbs that has any drawing already done for you. This one has Wisdom and Understanding each written three times in different fonts that you get to color in and decorate. 1. Read Proverbs 1:1-6 In Proverbs God gives us practical wisdom and understanding so that we can live godly lives. This poster is filled with wisdom and understanding. Your life will be beautiful if you fill it with wisdom and understanding. Make a beautiful poster. Make the words pretty by coloring some of the letters different colors and by filling some of the letters with tiny drawings of flowers, fruit, or geometric shapes. 2. Read Proverbs 3:17-18. Fill your frame with one large, beautiful tree as that tree looks in spring or summer. Find a picture of a certain variety of tree. Make sure your picture shows what kind of tree you have chosen. Remember that wisdom is a tree of life for you when you take hold of her. Be sure to visit the Notgrass website and you will be able to see samples of the Draw to Learn series. Notgrass Company is a family business that began in 1999. 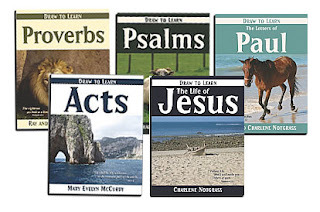 We develop Bible-based, easy-to-use homeschool curriculum that helps parents like you teach the heart, soul, and mind of your child. We are proud of you for making the choice to homeschool, and we believe that you can be successful. Why are we so confident? Because we believe in God who daily provides everything we need to do what He asks us to do. You are on a wonderful adventure. Don’t forget to enjoy the ride! Click on the banner below to learn what other Crew Members had to say about the Draw to Learn series along with the America the Beautiful curriculum.